September 11, 2018 Patrick Nemechek, D.O. 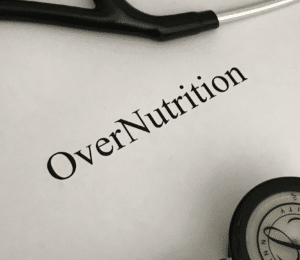 Overnutrition is a term that refers to how excessive nutrients can damage the human body. The modern diet has become a common source of excessive nutrients and increases dangerous levels of systemic inflammation within the body. The stress from the inflammation will activate the genes within our DNA and trigger or worsen common medical conditions such as cancer or diabetes. Many are familiar with the fact that eating too many calories or excessive amounts of carbohydrates (sugars and starches) can worsen a diabetic’s blood sugar level. The blood sugar levels increase to dangerous levels not because there are too many sugars in the food. It increases because excessive calories and carbohydrates trigger more inflammation and worsen diabetes at the genetic level. Saturated fats (palmitic acid) are commonly added packaged foods and if consumed in excessive amounts will also worsen the blood sugar levels through the inflammatory overnutrition reaction as well. Fortunately, you can reverse the inflammation and damage of overnutrition by activating a natural cellular repair mechanism called hormesis and can be activated through a simple eating pattern called intermittent fasting. In order to try intermittent fasting, you simply limit the calories you eat (maximum of 600 for men and 500 for women) on one or two nonconsecutive days per week. This is not a new dietary pattern for humans. Our stone age ancestors naturally engaged in fasting due to scarcity of food but the over-abundance of food in our modern world has eliminated these periods of involuntary but health-promoting intermittent fasting. Minimizes consumption of calorie dense foods, limiting your carbohydrate intake to less than 100 grams per day, avoiding mindless snacking, cooking foods at lower temperatures and adding a little intermittent fasting can go a long way towards preserving your health and even reverse some of your present medical conditions. © 2018. Nemechek Consultative Medicine. All Rights Reserved. Dear Dr. Nemechek, does constant administration of inulin around one teaspoon a day have the potential to cure an adult male at the age of 33 from plaque alopecia? Thank you for your help. It’s wonderful what you do for all those in need, especially autistic children. I generally have not had much success in autonomic recovery with inulin in adults. Other than pure intestinal issues, I have not seen inulin cause a significant shift in a patient’s non-neurological symptoms. Don’t let some genetic diagnosis shadow the important gains you are already seeing. We have many children recovery “in spite” of the genetic test results that supposedly suggest they will never recover. Ignore the tests and press on for recovery. Thank you so much, Doctor, for everything you do!!! Dear Dr. Nemechek. I was very impressed with your simple, yet remarkably effective, protocol. I know it has benefited many and would like to translate it to Hebrew so as more of my people get the chance to use it. If you are interested, please tell me how to go about it. That’s exciting to hear. As you may already know, translations are expensive and time consuming to produce and we can use all the help we can get. Please send an email the me via the Contact Us tab on our web site with particular details and I will responds. My 4 year old son with ASD has been on your Protocol since June 2018. I’ve recently started adding fresh herbs to our foods (cilantro, parsley, oregano) – will this effect the protocol? Should I stop? Also, I’ve always givin his inulin in two desperate doses throughout the day. I’ve recently heard it can be better to give the dose all at once? We read your book and following the protocol for last 11 weeks, just want your advice for calm down for sleep my 7Y old daughter, is it ok to use magnesium foot spray ? will it contradict with the protocol? Many people suggested in the facebook support group to use magnesium spray to improve sleep. Please need your valuable advice. I don’t know about a foot spray but oral magnesium can help. Also lowering the inulin dose can help as well. We read your book and very thankful to you to make up us for new hope , my daughter (6.5Y) in the protocol for three months and we see changes in the appetite recently, she is seeking more food than usual and eating more as well. And also she is playing with her fingers frequently which we noticed when she was 2-3 year and disappeared, but now we worried since she is more involving it again. how we can interpret these behaviours to the protocol? These are just signs of the awakening in her and should resolve soon. The inflammatory surge certain can cause injury to the nervous system but I do believe this is all reversible. we read your book and my daughter in the protocol for last two months, just want to ask you that is it ok to take grass fed beef in the diet? Yes, grass fed beef is perfectly acceptable. Hello. I apologize if I’ve missed the answer to this. A family friend just received a diagnosis is ALS. Does your protocol help with this to slow down progression or is it too late? Thank you kindly. I have noticed an increase of mucus in stool. I’m currently taking 3000mg DHA, the ALA, and 2 tablespoons EVOO. It seems even more so during and after a round of Rifaximin. Is this normal? I have been doing the NP for 3 months and have just finished my 2nd round of Rifaximin. I have not had patient with this same particular issues and I would say this is unusual and may not be directly related to rifaximin. If this continue or if associated with fever, abdominal pain or blood in the stool I recommend contacting your managing physician. My son has taken anti epilepsy medicine for 1,5 years. Each 4 months we make a special blood test to see the concentration of this anti epilepsy medicine. A few days ago we made the test. It showed that concentration of the medicine in the blood of my son is too high. It has always been normal before. My son is on the Protocol for 10 days. Could the Protocol influence this process? Thank you. The inulin will reverse bacterial overgrowth and this allows the gut to heal and potentially absorb medications better. This would lead to a higher blood level. My daughters and I are all on your protocol and having such success – thank you! For intermittent fasting for women (500 calories) would I have to count my olive oil from doing your protocol – or is that separate, as it would take up a lot of the daily calorie allowance, I imagine! I consider it separate since these oils are not readily available for energy on the same day they are consumed. Hi my 3.5 son has been on your Protocol for a month and has tiny gains. He has not gone through the awakening phase is that because he has a mild autisim or is it still coming? His does are 1/2tsp Inulin, 1.25ml Nordic Naturals Fish Oil and 1.5-2tbsp of oil. Should I change this? Thanks!! I really want to try intermittent fasting, I’ve heard of so many benefits. Is there a period of time where your body will need to transition to feel the effects? Potentially. Autonomic dysfunction can cause severe migraine headaches and flushing of the skin. Possibly these are happening together. I’m 26 and I’ve suffered from severe hyperhidrosis and therefore sympathetic overdrive since age 8. I’ve recently started your protocol and I feel much better mentally. Sadly I’m still unable to work, so I’m keen to know if the nervous system heals at the same rate as the brain? Also, I’m considering a 3 day water fast to speed up the recovery of my nervous system. Do you think it would be alright to break from your protocol for this purpose? Your advice is greatly appreciated, thank you. The overall nervous system (brain and peripheral nervous system) all recovery about the same rate. I have no understanding how a 3 day water fast is going to help your nervous system to recover. Our entire family is on your protocol and we have seen substantial gains in our child on the spectrum and our child who has some red flags. I have a question for you concerning a product that I recently read about called Clarifi. It’s a saliva test that detects autism and claims to measure molecules in the saliva. I’m curious to know your opinion on this product. Thanks! My daughter’s first child is 4 and non-verbal autism. He just started this Protocol 10 days ago. My daughter is 19 weeks pregnant with child number 2. Should she also be on Protocol and is it completely safe during pregnancy? My thoughts on prevention can be found in our book. Hi Dr. Nemechek….I wanted to know if the doses of the 3 supplements that I have to give to my child is about age or weight? … He is 4 years and 6 months old and weight 84 pounds…a big boy!! !..and it is about weight how much I should be giving?…thank you!!! Age vs weight? – no one knows for certain. Hello Dr Nemechek. I am from Macedonia and I am a mother of 14 years old girl who has suffered a stroke seven years ago. After that she has right side hemiplegia and epilepsy. I was wondering if I can start with the protocol but I am afraid because of the epilepsy. And if I start how to do that. My protocol reduces inflammation levels in the brain and this commonly results in fewer seizures. I have been suffering from chronic fatigue for 6 years. I started taking inulin and had something that happened to me before. Half of my tongue gets numb stinging swollen and turned white ( low blood flow). I looked for what it could be and it looks like raynaud attack. I never had any problem like that before until I started taking inulin. I haven’t stopped it. But now that I got this attack 4 times already, I wonder if I should stop it. This is more likely an neurological phenomena that is affecting your blood vessel constriction/dilation and not a primary blood flow issue per say. It’s also another example why I use rifaximin with adults instead of inulin. I have another question thanks. I read in your book that I should not take multivitamins or probiotics during your protocol (which I don’t). However, I do take a few other supplements (only vitamins and minerals). Should I stop taking these? I recommend stopping all supplements. I have recently started your protocol and I feel so much better already – thank you. I have a couple of questions regarding this please. I suffer from fructose malabsorption and I’m wondering if it’s ok for me to take inulin after Rifaximin (for food intolerances)? I’m also on Modified Citrus Pectin (Pectasol-C) to detoxify heavy metals, is it alright to stay on this during the protocol? I generally don’t find the inulin is necessary to take after rifaximin – this should resolve most food intolerance even better than inulin. A healthy gut bacteria seems to naturally detox heavy metals and my patients recover without detoxification supplements (they often do better without them). Hi we love you my son is on the oils and wow what a difference in my autistic 19 year old. Can’t wait for our appt in December with you. I have a question my healthy 22 year old daughter has bradycardia standing and working as a nurse she will feel faint and bpm is. 35 -43. No thyroid issues doesn’t take any meds and doesn’t drink smoke etc. no heart defects. Do you think this is an autonomic system issue and would your protocol and VNS help ? Good evening Dr. So do patients on the rifaximin have negative responses? Would my sons negative response to inulin lead to believe that he needs the rifaximin instead of inulin? Thank you for your expertise. If by negative response do you mean the awakening? If so, then yes the rifaxamin will cause the same difficult awakening response as the inulin. Watch my YouTube video on anxiety and aggression. Hi, you said to limit carbs to 100 grams a day. Is that all carbs naturally occurring and added? Intoxication with alcohol can cause a short-lived neuropathy that has the potential of cause SIBO relapse. That is different that saying a glass of wine with dinner would do the same. The hair issues takes about 3 months to notice improvement with substantial gains around 6 months after rifaximin. I read your book and started the protocol a couple of month ago. My child was on inulin for a while and then on Rifaximin. Should she resume inulin after finishing Rifaximin? Not necessarily but it won’t harm anything if you’d like to try. A visit to my office would be necessary since we no longer accept phone Skype visits for residents within the U.S.
Read more of my posts about reflux and you might be able to get someone to address your bacterial overgrowth with Xifaxan and you could start the other elements of the protocol outlined in our autism book. The doses recommend for adults with autism were developed in adults without autism over 15 years of research. The book will give you some good pointer about how to help your daughter.